3.The first row is also long and short Spanish feather stitch and half cretan stitch was worked through this stitch in the second row. 4.The Spanish feather stitch rows are first whipped and then laced in these samples. 5.Spanish feather stitches were worked over-buttonhole stitch, feather stitch and herringbone stitch in these rows. 6. 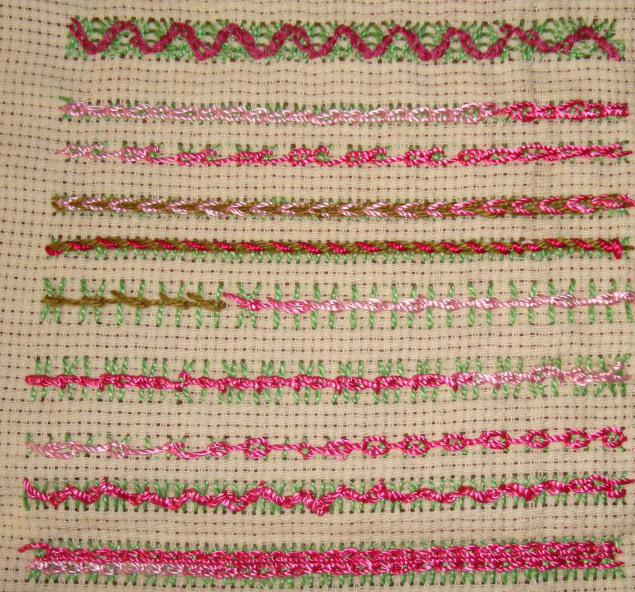 Spanish feather stitches are worked over- cretan stitch, chevron stitch and zigzag coral stitch in these samples. 3.In this part of the sampler, raised chain stitches are worked over Breton stitch and square herringbone stitches and with pistil stitches. 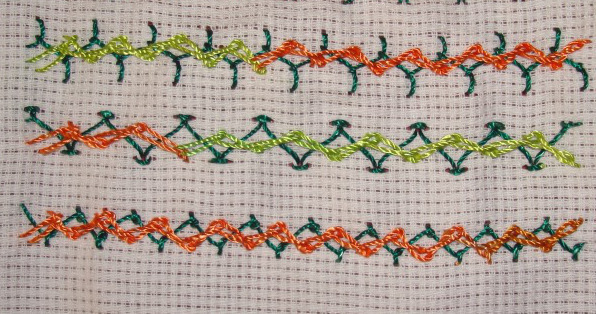 4.Detached chain stitches are worked with raised chain stitches in the first row. Two row of raised chain stitches are laced in the last sample. 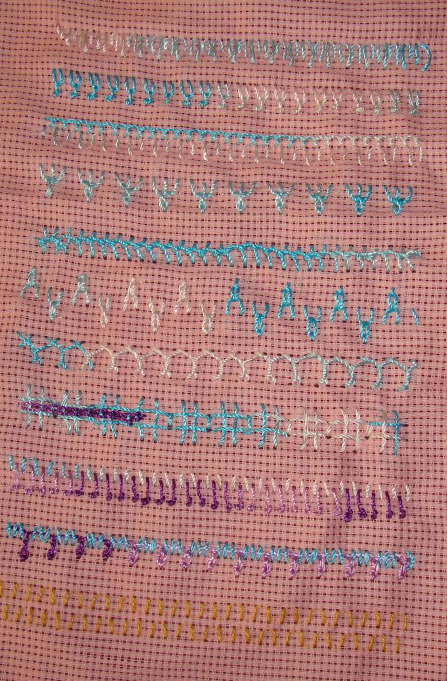 I worked a few variations of this stitch to maintain the routine of this challenge. 1.The second version of raised chain stitches are worked over these stitch rows. 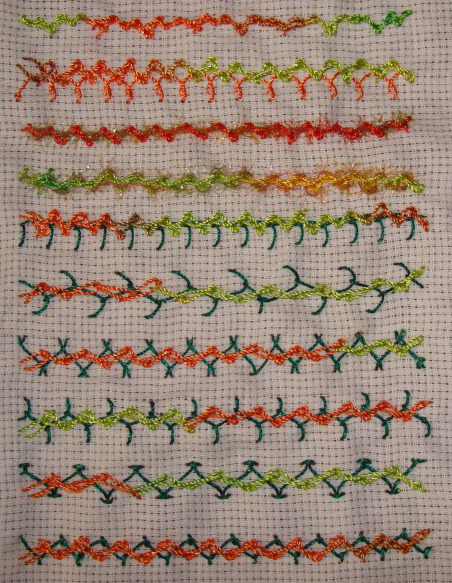 The straight stitches are worked in repeating pattern in the first row. 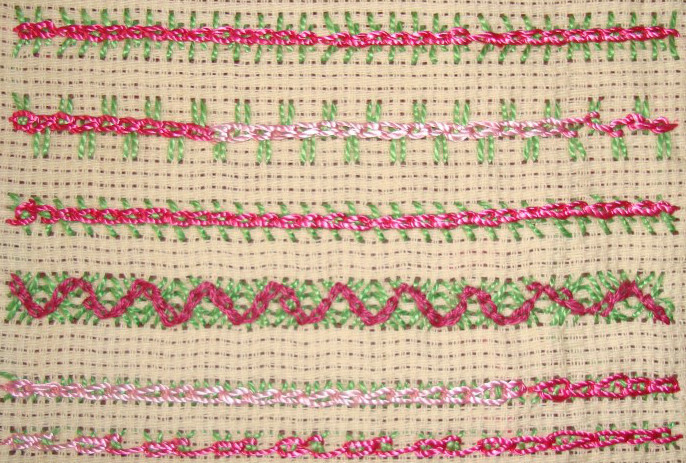 Italian border stitches are worked in the second row. 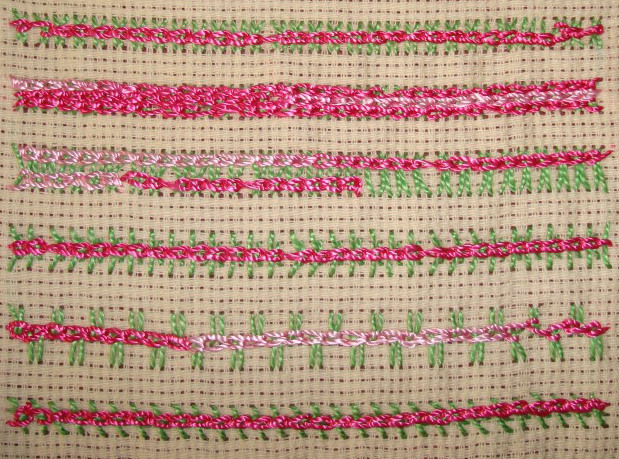 Buttonhole stitch is worked over raised chain in the third row. 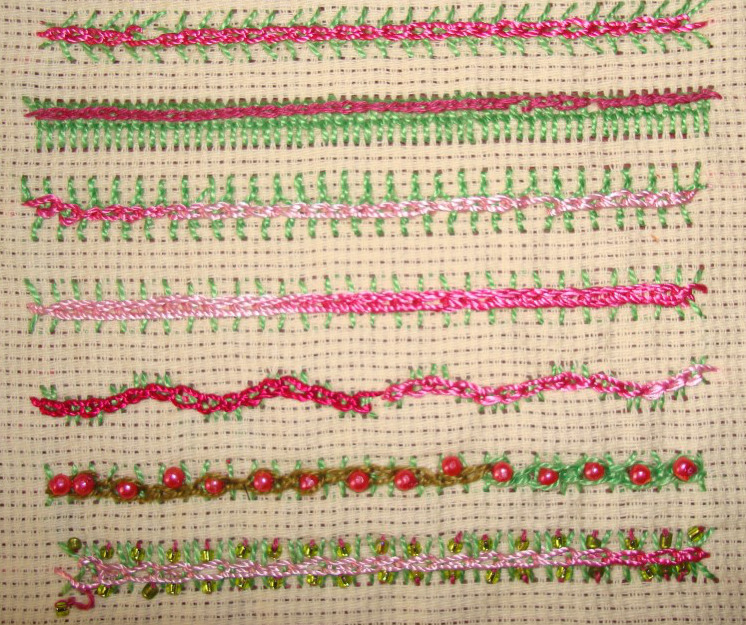 Isolated linked double chain stitches, knotted loop stitch and wheat ear stitches. 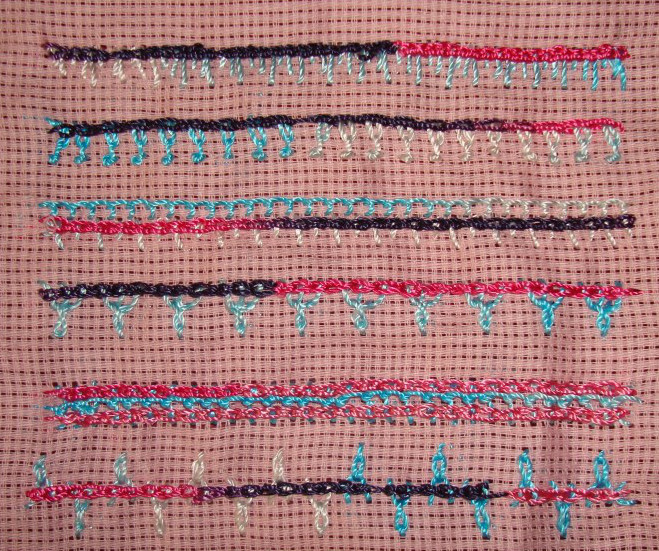 Second part of the sampler has the same theme with raised chain worked over cashmere stitch and an open and closed chain variation. Whipped chain[single and double] twisted chain, cable chain zigzag chain are worked in this part of the sampler. 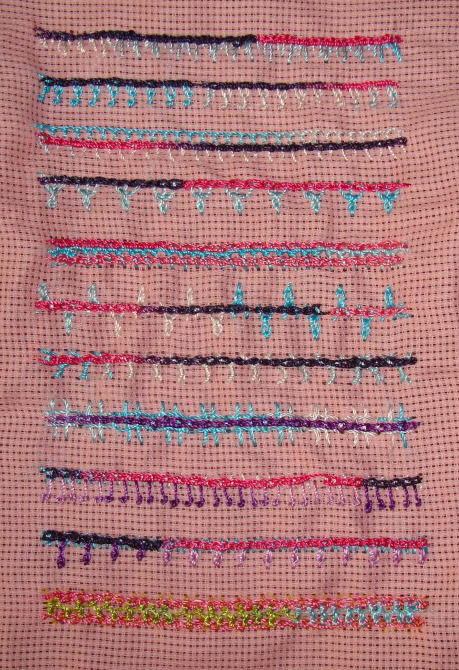 The last part of the sampler with beads worked on two samples.